Hurry and excitement this morning when the captain told us to pack as soon as possible. The best weather window for the next week urges us to leave after lunch this Saturday. Going through the Beagle channel, however, promises spectacular sceneries that we’re all looking forward to. 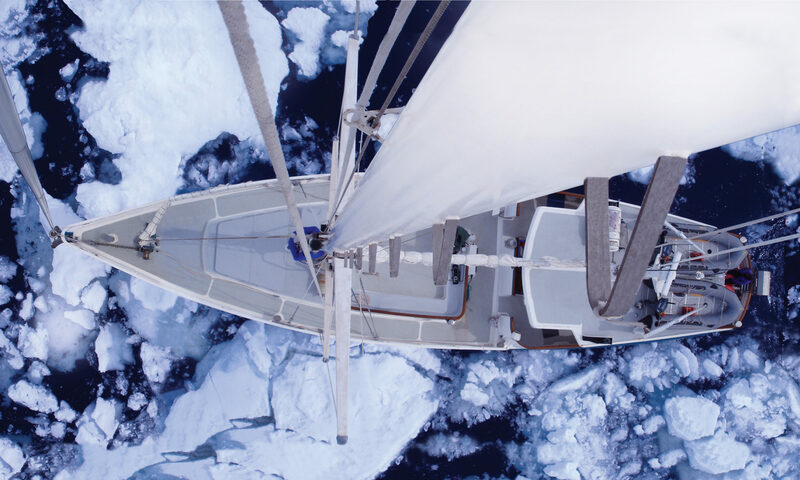 Expeditions to very remote places like Antarctica always come with the possibility that something really unforeseen happens, as we know way too well. So, a little insecurity will inevitably remain. Nevertheless, we have now retrieved our material that was kindly stored by our Argentinian colleagues at CADIC and loaded everything onto the ship. We also purchased some extra bits here and there and tested some of our equipment. We hope to leave tomorrow night. Fingers crossed for a merciful Drake passage. The front of the “Australis” used to load equipment. After a good night of sleep we are feeding ourselves before heading to our boat the RV Australis: today the main task will be to get our previous campaign boxes from the CADIC institute to the boat and rearrange everything and test that everything works properly! Weather here is +4°C… a good preparation for the frozen planet ahead. Sunshine, 35 °C. No, that’s not Antarctica yet. We’re currently sweating in Buenos Aires, Argentina. So far everything goes smoothly, also with all our extra luggage. We should arrive in Ushuaia tonight. Can’t wait! It’s been a year or so. And here we are again. What a weird, but wonderful feeling. All packed, all excited, all a tiny bit nervous. Thanks to the very generous support from many people and organizations we have the chance to complete what did not work in the first attempt. And we all are here again, the same team, only stronger. Right now shuffling luggage once again. More soon. I guess there’s no easy way to say this. About 24h ago we suffered an engine problem, more specifically a broken gearbox. Although the crew tried very hard, this is something that couldn’t be fixed on the spot. Very bad luck. We turned around and are sailing back towards Ushuaia. We’re all safe and sound and the weather conditions are fine. The spare parts needed for repairs won’t arrive soon though, so it will be the end of this year’s attempt for our expedition. Time is a relative thing. We left Belgium only 4 days ago – feels much longer with all that happened. Now, it accelerates again, throttle down and off: last dinner, shower, night, and right now breakfast on land. We got a security briefing yesterday already. Departure within the next hour. Approx. 8h until Cape Horn and then enter the Drake Passage. Drake lake or Drake shake? Either way, here we go! The countdown’s ticking very fast… only two days until departure in Brussels. In the meantime our scientific equipment has already arrived and was taken aboard. Hooray! Sending oftentimes valuable, sometimes unique (think ROV, special diving & fishing devices, …) gear half way round the world and back can be challenging, to say the least. A lot of administration and paperwork (and patience) is needed to get everything on track. Luckily our chief has been very persistent and eventually managed to master the bureaucracy jungle attached to the task. So, now it’s there and we have some graphic proof, which is great… but, hey, wait what is that?! What happened to our box (very solid and sturdy aluminum box that is)? Things rarely go as planned with end of the world exploration. And so our first surprise is an equipment box already punched in before it even got on board. We’re still lucky though. Nothing absolutely crucial seems to be in that box and also while the box itself has definitely changed shape, the content seems largely intact. Phew. Back in Europe our next immediate challenge is to not overload our bags and get everything checked in.